We have just the rental equipment you need for your next party or event! 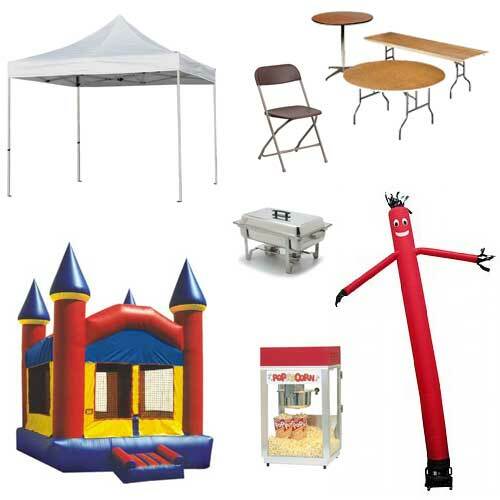 Offering tents, tables, chairs as well as bounce houses and slush machines, we can help stage parties of any size or style. We also offer an impressive selection of linens in many colors. If you are in need of a large tent or specialty items, we have access to them as well. Tents are set up and taken down at your site by our professional Tent Crew. Delivery charges apply. You can shop our online rental catalog, select the items you need, and submit a Quote Request. Or, feel free to call us to schedule your party rentals. Our party rental professionals will be happy to partner with you to stage a perfect event. Smart renters rent at Rent Smart! We look forward to being a part of your next party!